Like all of you, I’ve had my trails playing the tight four-hole opening stretch at Twin Oaks. I’ve probably played them 20 times or so now, achieving mixed results. Dozens of lost balls have gradually coaxed me into a less aggressive strategy that doesn’t make for as many birdies, but it makes for a lot fewer bogies. I’ve taken a bit of a survivalist mentality about the opening combination of two short par-4s, a long par-5 and a mid-length par-3. I had a bit of a breakthrough on this stretch, however, two weeks ago thanks for a breakthrough in TaylorMade’s R & D department. I was carrying TaylorMade’s new SLDR Mini Driver for the first time. The Mini Driver is a club between a driver and a 3-wood. It’s a driver with a 260cc and a Speed Slot, designed to provide the accuracy of a 3-wood off the tee while providing the distance of a driver, or just shy of. TaylorMade gave me an advance chance to experience the Mini Driver, and I took to it immediately. My first shots on the range were dead straight, and I found I was able to hit it about 260-280 yards, sacrificing only 20-40 yards from my driver. With this new weapon stashed in my bag, I approached the first tee at Twin Oaks. The opening dogleg doesn’t play to my draw, but I’ve learned to basically get by punching a 3-wood out left, just past the tree. 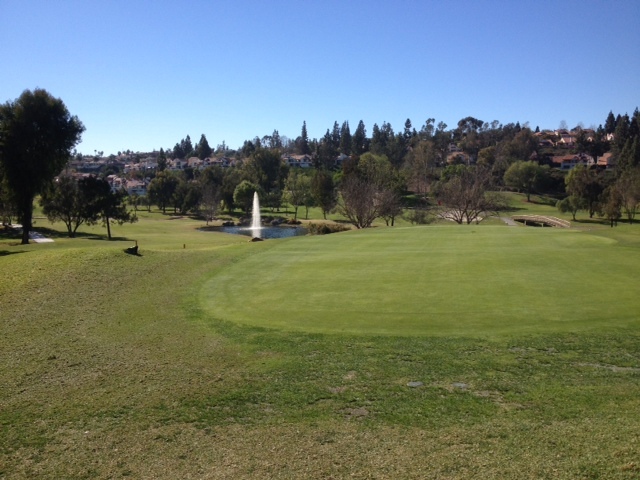 Well, two weeks ago, I pulled the Mini, which is ideal for shorter par-4s, especially tight ones. In short, I hit my best drive ever on this hole. I took it 280 yards right up the middle, leaving me about 50 yards. Due to a two-putt, birdie eluded me, but I felt like I was onto something. Unfortunately, I pulled my tee ball OB with the Mini on the difficult par-5 2nd, but I executed the drive on No. 4 to just shy of the two fairway traps to set me up for another par. I got around the opening holes in 2-over, which may or may not be my best, but it felt different. This felt like success I could repeat, and hopefully drop a few putts the next time. The Mini Driver comes in lofts of 12, 14 and 16 degrees. The lofts are supposed to remove sidespin from the ball to produce straight shots and thus more balls in the fairway. At a media event for the Mini on Monday at La Costa Resort and Spa, TaylorMade’s Brian Bazzel, Senior Director of Product Creation for Metalwoods, explained the performance benefits of increased loft. Bazzel says shorter hitters in particular can benefit from increased loft. Putting the Mini in of course means taking a club out. Bazzel says that decision will be different for each player depending largely on what loft their driver is and then gapping appropriately after. But Bazzel says the evolution of club combinations in golf bags has already begun. 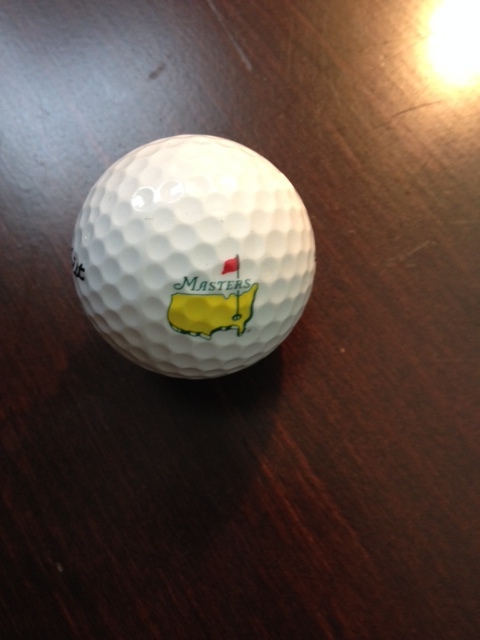 Don’t be surprised if it shows up in a bag of one of your playing partners soon. The club went on sale in May and retails for $279. The club is designed for enhanced performance off the tee, but can be played from the fairway as well. Bazzel says he’s still discovering the shots that can be hit with it. As for me, my driver is out and the Mini is in. I’ve been experiencing a bit of the driver doldrums recently and the Mini has proven an excellent remedy. For more information about the Mini, contact your JC pro and see if it’s a club that fits into your golf bag of the future. When reviewing golf courses from one golfer to another, we usually first default to brevity and try to capture the course in a word. For Strawberry Farms in Irvine, that word is “tight,” which we all know is golf speak for narrow. That’s partly why I’ve shied away from this course when it has been presented as an option in the past. Well, last week, there was no option. We had an online deal and this was the course we were playing. So I stocked up on golf balls and pointed my car north prepared to experience a little pain and frustration – & hopefully discover a great golf course along the way. What I found is a beautiful course with a lot of scenic holes, many of which are, indeed, tight, especially on the back nine. In golf, this is what we call a shot-maker’s course, and you know it’s going to require strategy and to occasionally check your ego on the tee and hit iron. 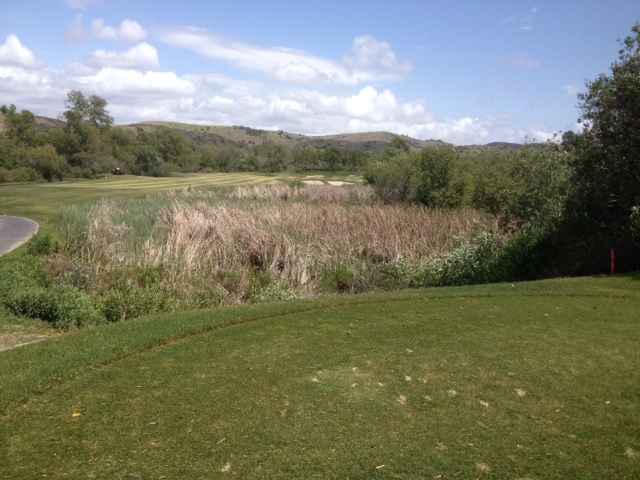 One of the holes were you could, and probably should, do that is the short par-4 8th … but that’s not what I did. I went for it, and made it, thanks for a weapon in my bag that is more than the point of this post than the course. As you can see from the photo, No. 8 is one of those diagonal fairways littered by bunkers. Playing it for the first time, it’s nearly impossible to pick the proper aim line because you don’t have any experience with the yardages and the landing area. Well, the day we played I looked at the green sitting 292 yards out, noticed the wind behind me and decided there’d be no laying up. 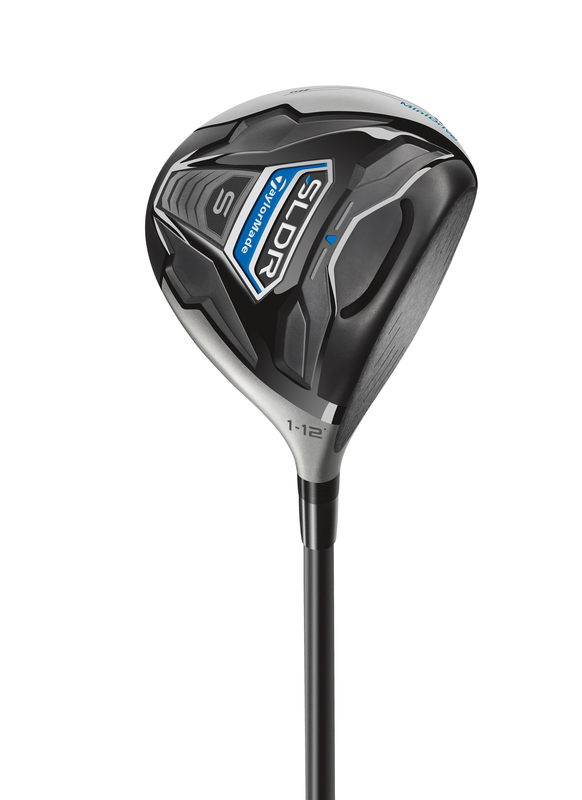 With that, I reached in my bag and pulled my 14-degree SLDR Mini Driver, the latest club breakthrough from TaylorMade. It’s a driver with a 260cc head that performs more like a 3-wood off the tee in terms of accuracy, but it’s got a Speed Slot so you still get distance. After two weeks of toying with this club, I hit it fairly straight and about 260-280 yards, about 20-40 less than my driver. It’s ideal for a hole like No. 8, which is usually the type of hole that hands me my lunch because I hit a draw and struggle working the ball left to right. The Mini Driver turned this from a nervous tee shot into a confident one. I hit a ball high in the wind, aimed at the front left of the green, and it carried the pot bunker in front and settled in some rough near the fringe. I’ve had a few success stories so far with this club, but this was by far the best. My playing partner took his first swing with it and got similar success, though he was about 10 yards shorter and caught the pot bunker. Still, they were two impressive shots that ultimately produced pars. You’ll be reading more about the Mini some pieces I’ve got coming up, but I wanted to share this experience because it’s one I’m not using elsewhere and is the example of the perfect shot scenario for this club. If you try this club, you’ll notice you get a feel for it very quickly. The three people I’ve had try it have been immediately impressed. With that quick trust in hand, you quickly start get a sense for when to pull this club. I’m using it as my driver right now and haven’t really tried hitting it out of the fairway, though I’m told it works well off the deck, too. Anyway, if you happen to have a chance to experience this club, I’d appreciate you adding your two cents in the comments. I’m cataloging my Mini Moments as I continue to play with this club, and I’m sure you’ll see future posts here about it. Maybe I can include you. 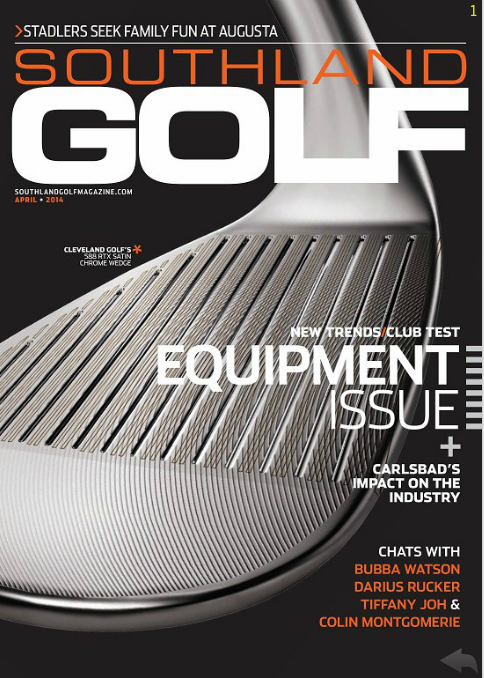 Stay tuned to your local – heck, global – golf blog for more Mini news to come. My Southland Golf connection afforded me a unique opportunity last Saturday. I was one of about 15 or so golfers to participate in a club test for much of the latest equipment by the major manufacturers. 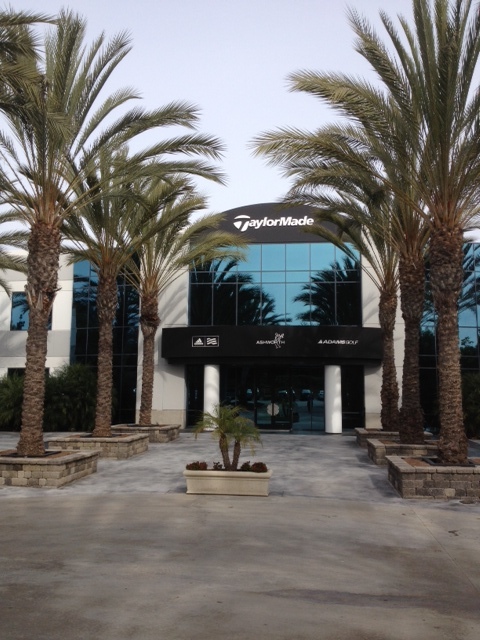 This was conducted at Oak Creek in Irvine, which was holding a huge demo day featuring TaylorMade, Callaway, Nike, Cobra Puma, Ping and Cleveland. 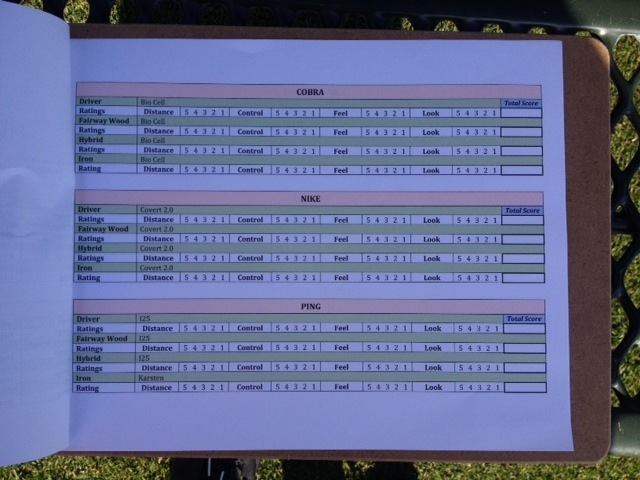 The task was to hit each company’s clubs in four categories (driver, fairway wood, hybrid and irons) and rate each 1-5 (five being the best) on performance in four characteristics – distance, control, feel and look. If that sounds daunting, it’s because it is. Trying to be fair and thorough, it took me four hours to get through this exercise, which I didn’t completely complete (more on that later). I’d never had a chance to test clubs en masse like this before, which is why I was eager to participate. Through my work with Southland and my time at the Golf Academy, I was most familiar with the clubs from TaylorMade and Callaway and least familiar with Nike. I’d never hit one of their clubs before and couldn’t recall playing with even one person who had their driver. Anyway, since equipment has become a bit of a writing niche for me, I thought this experience was essential to having me be properly knowledgeable. 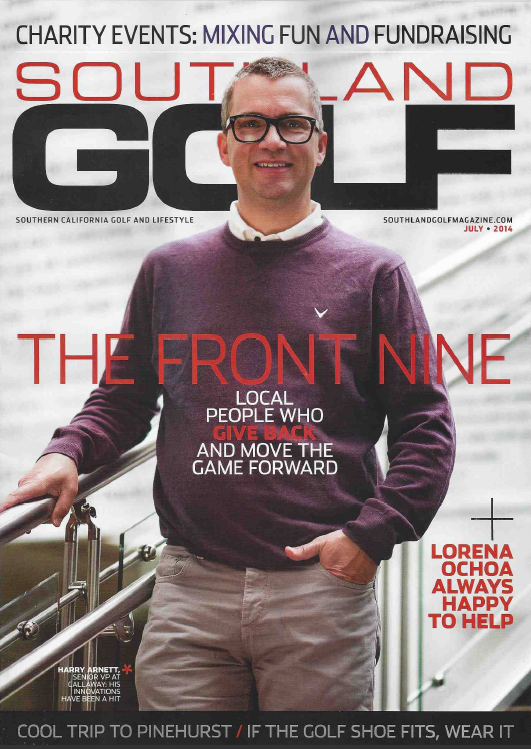 I’m not going to divulge the results here (you’ll be able to find them in the April issue of Southland Golf), but what I wanted to do with this post is mostly relate the experience and relay some general findings. For now, the blog is going to avoid specific club recommendations/endorsements, but if you email me, I can help you the best I can. I’ve been getting more of these type questions recently as people are pondering purchases. First, I should give you the set up of my bag, so you know my biases. My clubs have mostly all been fitted for me, and I consider my bag to be settled, save for a potential new driver purchase, although you’ll read later while I’m wavering on that. Driver/3-wood – the Stage 2 TaylorMade Rocketballz. Yes, it’s my driver, too, and the rock star of my golf bag. Golf friends of mine actually will get upset with me if I try to hit something else off the tee. I actually have a Callaway Ignite 10.5 and only old TaylorMade 9.5 Steelhead I carry on occasion, mostly because they hit a straighter ball for me and my RBZ hits a great little draw – and a long way. Hybrid – Nickent, 19 degree. Putter – Cleveland blade that I bought used last year and love. So this was the standard the new clubs were up against. Like I said, I feel this set up works for me and I’ve acquired nearly all of it in the last year, so I don’t feel much impulse to change at the moment. That said, I was certainly curious to see how the new gear performs, especially after having written and read so much about it recently. The first challenge I encountered was simply to set up a model for the test. I really wasn’t given one and wanted to come up with a method that was fair. 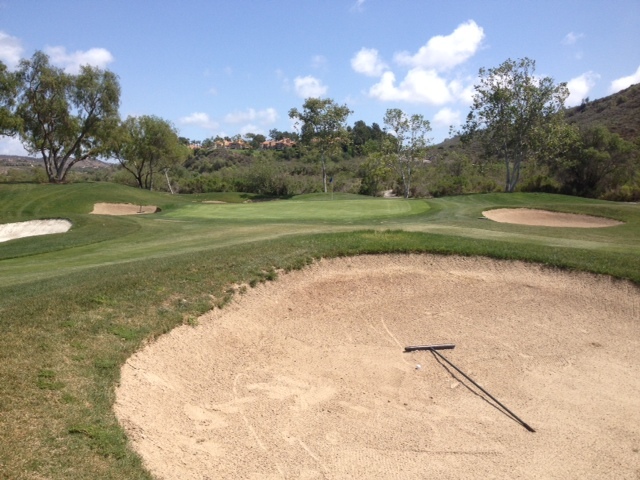 I decided not to judge a club’s performance until I felt I could hit five consecutive good shots with it. This allowed for some acclimation time with set up, tee height, etc., for various clubs. And of those five shots, save for driver, I wanted to hit some of them off the ground and a few off the tee to somewhat simulate a round. Some quick math of the information provided will tell you this is a lot of golf swings. Too many, actually. Fatigue was the biggest factor. Figuring on that, I hit the least familiar clubs first, to give them my best shot, and saved the more known products for the back end of my session. My swing hit the wall at least twice, but at times it was hard to tell if it was me or the clubs. I will say there was one manufacturer whose clubs I couldn’t hit at all, so in that case, I don’t have doubt – it was the clubs. Everything seemed to be off, to my feel and my eye, and I probably spent too much time trying to make their gear work for me. After 20 minutes of futility, I moved on to more familiar equipment and the ball started jumping again immediately. I got through three company’s sets and then broke for lunch. I then hit two more and while I was testing a TaylorMade driver, it finally happened – rip. Yep, I ripped open a blister on my pinkie finger. And I can’t remember the last time I got a golf blister. Being a trooper, I Band-Aided it up and soldiered on, but I shortly thereafter DQ’d myself with one equipment company left to go – one I know well, so I wasn’t too concerned about not finishing. I learned a lot about equipment and what works for me on Saturday. However, given how different swing profiles are, there’s no guarantee what works for me will work for you. For instance, I seem to be the only golfer I know who can’t hit the mew Titleist driver. I have several friends who own it and love it. I’ve tried it a number of times now and even under optimal set up conditions on Saturday, I got ordinary results at best. I don’t get it because it feels good to me. I just doesn’t wow me after that. And, as I’ve said, I’m the outlier here. Truth be told, most of the drivers felt heavy to me. This is partly why I favor my 3-wood. I like the lighter weight. I feel like all I have to do is pull it through and I get effortless distance. That said, I was very curious to test the other 3-woods against my 3-wood, and I have to say they faired quite well. I was probably most impressed with the across-the-board performance in this category. Nearly every one I tested seemed to pack a lot of pop for a smaller club. Actually, probably the longest ball I hit all day came off my first swing of a 3-wood. It launched low and was on the end of the range in a blink. I would seriously look at this option, for performance reasons and a economic ones, before looking at making a biggest investment in a driver. The other revelation was in hybrids. This is where I found the greatest disparity in performance, and you can really tell the difference from company to company just be looking at the them. The club head sizes ranged from tiny, and I mean the size of a candy bar, to those that were pretty plump, like a 5-wood almost. The size, for me, translated entirely to confidence in the ability to the hit the club. I couldn’t even get the smallest one off the ground. Some of the others, I hit and got surprising distance from. If I were to make a change, adding a second hybrid is definitely something I’d consider. And as for purchases, I would definitely take your time with this one since there is such a noticeable disparity in what each company offers. As for irons, I hit some very goods one – and found I got the best performance often with blades – but I didn’t experience anything that would prompt me to change, though I certainly know my next two preferences would be if I had to. The only thing we didn’t test was putters, but I had my favorite conversation of the day about putters. I feel the same way about the Cleveland I acquired last year. I don’t always make them, but putting and chipping are the two things I know I can roll out of bed and do every round. But the LA tester and I got talking about how personal putters are. “You have your most personal connection with your putter,” he said, and he’s so right. That prompted me to a realization. When you hit a bad drive, it’s the club. When you hit a bad iron or wedge shot, it’s the club. When you miss a putt … it’s you. Seriously, how often do you blame your putter. After a miss, it’s the green or the read or the stroke. The last thing it is is your putter’s fault. Maybe this is because putting can be just plain hard, but I think it goes back to bond. Our putter became our putter for a reason – at some point it made putts. Putts we obviously still recall and cherish and have endeared us to the club. Drivers can be flaky, but for some reason, once we trust a putter, it’s considered to be the model of consistency. When it misses, we’re flawed. Maybe because it’s because we inherently hate change and changing putters is a scary thought for many of us. Anyway, that probably should’ve been its own post, under “Ode to Putters” or something, but it just shows you that the people who tested Saturday take their equipment seriously. I can tell you in the brief chat I had with a few other testers, we had fairly uniform consensus, so I suspect the results in the issue with be fairly declarative about what people liked and what they didn’t. You can look forward to that issue in April, but, like I said, if you have questions feel free to email me and I’ll do my best to give insight. For now, I can tell you Band-Aid brand is still the No. 1 Band-Aid. I’m typing this pain-free and ready for my rounds this week, same mostly reliable clubs in tow.